There are other people with the name Eddie Lewis who pop up now and again. There’s a famous soccer player and a character from the movie Pretty Woman. In the phone book there are over fifty people with Edward Lewis as their name in Houston alone. But what I find very interesting is that there are at least three established trumpet players with our name. There was an Ed Lewis who played for some time with the Count Basie band. He was originally a Kansas City player who worked a while with Bennie Moten. He did short stints with Thamon Hayes, Harlan Leonard, and Jay McShann before joining the Count Basie band for eleven years. Online sources suggest that this Ed Lewis was a good jazz soloist, but his reading skills and great chops meant that he was most often called to play lead. This is offered, I think, as an explanation for why this Ed Lewis isn’t more widely known. Although he lead his on band in New York after he left the Basie band, he never did a recording date as a leader of his own band. There is an orchestral player named Ed Lewis who went to Juliard and Eastman and earned his doctorate at NYU. He is an accomplished soloist and ensemble judge who has performed with orchestras all over North America. The most remarkable namesake is a Mr. Ed ‘Tiger’ Lewis. It’s one thing to share trumpet and formal names with someone, but for us both to have the same nick name? How unlikely is that? My father started calling me Tiger before I was born. My name at home was always Tiger and even Pearl and her family call me Tiger today. So I obviously didn’t copy cat Mr. Ed Tiger Lewis. But you have to wonder how this could have happened. It seems like a very unlikely coincidence. Is it possible that there is a deeper connection? 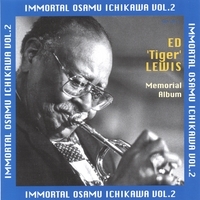 On the album notes for Ed “Tiger” Lewis’ Memorial CD, on CD Baby, it says that people sometimes mixed up the two Ed Lewis jazz players. One time Tiger actually received a pay check that the other Ed Lewis earned. So it’s no surprise that people are still mixing them up today. There is a blog post a The Crown Propeller that shows Ed “Tiger” Lewis performing with his own group at the West End in 1980. The problem is that Ed “Tiger” Lewis, according to the page on CD Baby, wasn’t playing during that time. He was working as a limo driver. I’m not a historian and I have no intention of challenging anyone’s statements when I don’t know myself. I am simply pointing out how easy it is to get people mixed up. In fact, there is yet another Eddie Lewis who composed a piece that has been used by figure skaters and people often think that was me. I know that, when you do a search online for Eddie Lewis trumpet players, with or without the nickname Tiger, most of the results lead to me. So it’s to be expected.